A 3 liter tin (3.2 quarts) with some traditional recipes included. 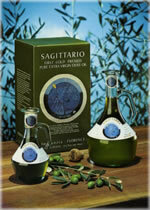 One Case of six ¾ liter cruets in gift boxes with some traditional recipes included. One Case of two ¼ liter bottles of extraordinary balsamic vinegar Fattoria Estenses no.12. Contact us for information on where to buy.